I’m the mom of two girls, but I also consider myself the mom of my two furbabies, Princess and Misty. I may not have given birth to them (obviously since I’m not a cat), but I think of them as important part of our family. I first became a cat mom when my daughter was about three years old. Growing up, our family only ever had dogs because my mom was allergic to cats. I always pictured myself as a dog owner and surprised myself by how much I loved owning cats. 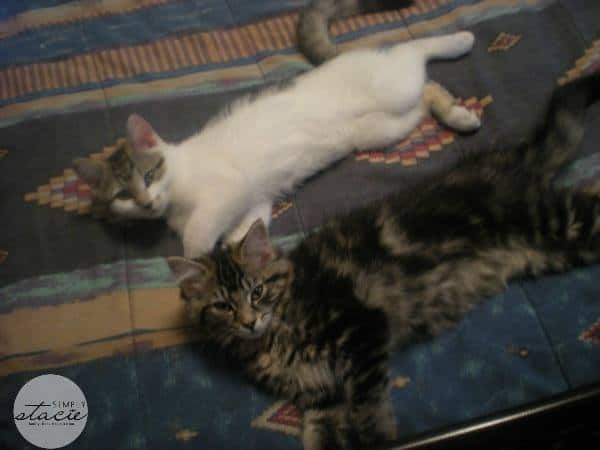 We adopted Princess and Misty in May 2010 as kittens. I’d been looking for kittens on Kijiji and found someone local who had two kittens to give away. Her grandson was allergic to cats and he was living with them so she couldn’t keep them. They were littermates and though I’d only planned on getting one cat, I couldn’t separate them and ended up taking them both. They were so precious as kittens and inseparable. Princess and Misty are now 4 years old and are still best friends. They sleep together, groom each other, play together and are never too far apart. I’m a proud cat mom and often share pictures on my Facebook profile and Instagram of my cats. They are my furbabies and I love showing them off. Today I wanted to share with you the best things about being a mom to my two cats. 1. Cats are funny. Cats can do crazy things and mine bring me joy and laughter. I’ve caught them in awkward situations that made me laugh so hard I’ve cried. Princess always sits in weird positions and I try to snap a pic if my iPhone is nearby. Misty also has her moments. She flipped out when a dog came over and literally scaled the kitchen cupboards and climbed into a hole in the ceiling. I’ve never seen a cat move as fast as she did. She was like “Super Cat”. 2. Cats make me a better person. I’ve got lots of love to give and my two cats get loads of attention and kitty kisses. I worry about them when they aren’t feeling good and truly want them to be happy and content. John says I spoil them, but so what? They are my furbabies and I love them. Look at this face? How could you not love something so beautiful. 3. Cats make great companions. Princess and Misty are solely indoor cats and spend many hours during the day at my side resting. I work from home and am often alone so it’s nice to have them there to keep me company. They keep me warm during the winter months and love to curl up at my feet. Cats are also independent animals so they do go off on and do their own thing too. They give me my space and I give them their’s. They normally come when I call their names…most of the time anyways! 4. My cats rely on me to take care of them. I know the saying that dogs have owners and cats have staff and that may be true. However, my cats need me to take care of their basic needs. I make sure they have food, water, clean litter and that their vaccinations are up to date. I take them to the vet when they aren’t feeling good and want them to be happy. 5. My cats benefit my health. I’ve read studies about how owning a cat can actually benefit your health. Cats lower your stress levels and even improve your heart health. 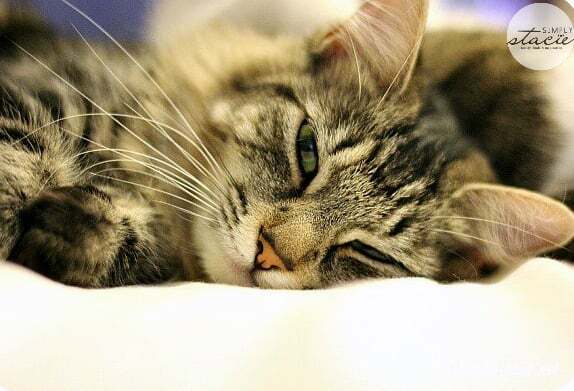 Google cats and health benefits and you’ll see a huge list of posts from a variety of sources about how owning a cat is good for you. I believe it. When I’m stressed out and having a bad day, I feel 100 times better when Misty or Princess comes in for a cuddle. Even the simple act of petting my cat and listening to her purr can calm my frazzled nerves. Like I said I only want the best for my cats. That’s one of the reasons why I feed them Petcurean cat food. Their premium quality cat food offers unique and tasty recipes full of important nutrients they need to stay in good health. Most importantly, my cats love the food. Petcurean has a variety of pet food for both dogs and cats. One of their product lines for cats is the NOW FRESH™ dry cat food. Like it’s name, it’s packed full of nutritious (and fresh) ingredients like 100% market-fresh turkey, salmon, and duck as well as 100% fresh Omega 3 and 6 oils, berries, fruits and veggies.It has no grains, no rendered meats, no by-products and no artificial preservatives. Visit Petcurean to learn more and discover the Petcurean difference! Petcurean is conducting a short survey on pets and is inviting people in the US and Canada to share their opinions on pets. It takes about 10 to 20 minutes to complete and when you are done you’ll be entered to win the grand prize of $500 cash + 4 prizes of $100 cash. $500 cash to both the Nominator and Nominee. The grand prize is valued at $2,000 CAD! 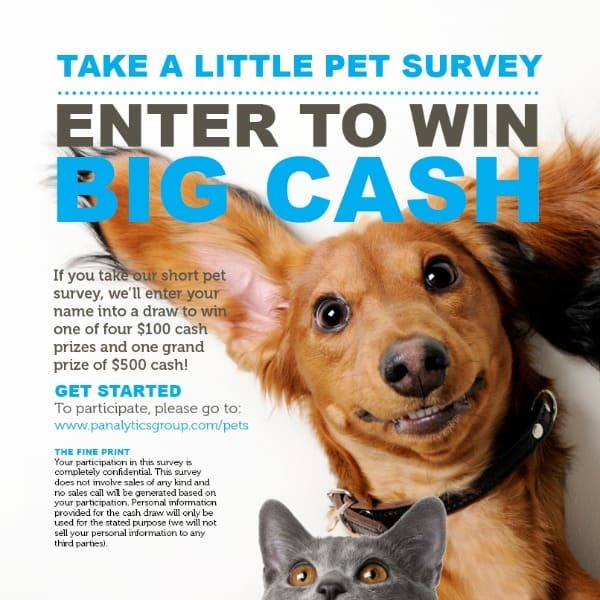 To enter the contest, head over to Petcurean on Facebook and like their page. Then click on the Contest Tab and click Submit an entry. Fill in the form and upload a photo of the mom you are nominating and write a caption describing why you are nominating her. Then click Submit entry. Then on May 30th head on over to their Facebook page to see if you have won. They’ll be posting them on their Facebook page on or before May 31 at midnight. The contest is open until May 30th at 8:59 am PST and residents of Canada (excludes Quebec) and the USA who have reached the age of majority are welcome to enter. Remember if you win so does the mom you nominate! I encourage you to enter. It’s a great prize for you and someone you care about! I have always liked cats myself and we use to have one. My son has became alergic to them. They tare his nose and eyes up. They use to not bother him but he got alergic when he was about ten. All he has to do is be around someone that has a cat and he is snizzing rubbing his eyes and going crazy. I love my kitties, they all have different personalities. I have three. I’m also the mother of 2 cats as well as 2 dogs. We have had pets since I was a toddler (I have home movies of me as a 2 year old dancing in front of the Christmas tree with the 2 dogs we had at the time.) I think it’s one of the best values my parents instilled in me, loving and being loved by dogs and cats. Yours are adorable. Really beautiful! I love cats so much! We love our kitten too. Growing up we had a cat but it ran away, yeah…It was sad. 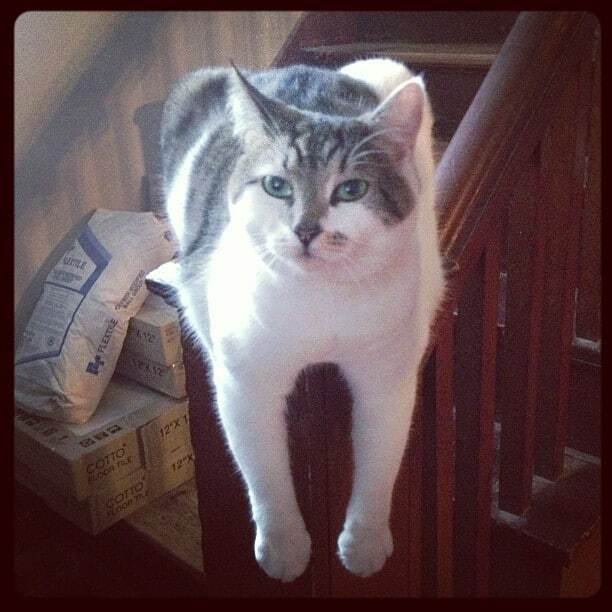 We always had a dog but cats are pretty awesome. I’m trying to talk the friend into getting one. I have a chinchilla so I don’t think it would end well for Ruppert. Haha, your cats are so cute! I want to squeeze them both, specially the fluffy one. You can’t help laughing at their crazy antics! my cat makes me laugh everyday! I love cats. We just got a new kitten so now we have 2 my daughters love them:) and love to cuddle with them. love animals – would definitely have some if we were home more often. I’m a mom to two cats, one adult and one kitten . They are most definitely my babies and I couldn’t imagine life without them! It’s great the way you talk and feel about your cats. You don’t have to give birth to be a mom. Love makes it…you love your furbabies. It’s great how you know their personalities because they do all have unique personalities and traits. Call their names, hug them, and your heart warms as they purr to you. Reminds me when I had cats …lots of cats while growing up. We had 2 mama cats and 2 litters all at the same time. So my sisters(5 of them) and I were all little caregivers to all those cats! In my opinion, cats make great additions to any house. I just had to put down my “Kitty” after over 17 years. It was a tough day. I have always been a pet person and grew up surrounded by animals. I currently have 2 cats and a dog, and they are the best. Pets are amazing! I love my furbaby he is a character. He definitely loves his mommy! My husband bought him from a shelter for my birthday 3 years ago and he has been my sidekick ever since. I miss having a cat. Have to think about getting another one. I’m the mommy to 3 cats, like you I grew up with dogs and never knew how much I would enjoy being a cat owner until I ended up with each cat (all three had been abandoned at different points of my life). They bring me a lot of joy and make me LOL too! I think this calls for a group…….awe!